The physical world can inspire, whether it’s the Appalachian Trail, or your bedroom, or the Himalayas. And while not everyone can live in Paris or visit Yosemite National Park, we can all be inspired by our own personal universes. Moreover, if your world can inspire you, then your readers can come along for the ride. 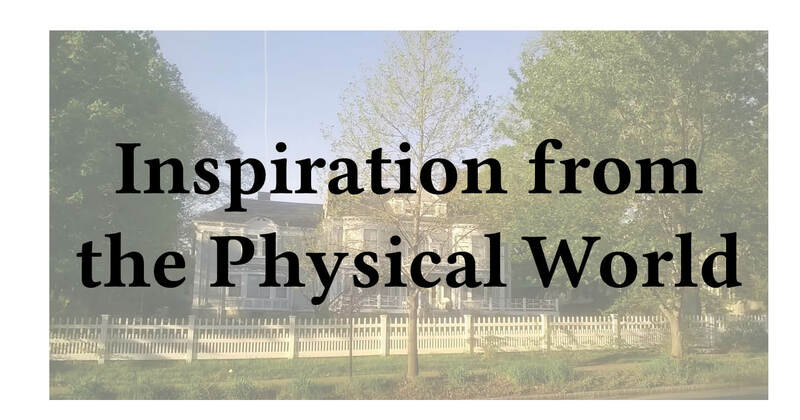 Does the physical world inspire you? So consider The Chronicles of Narnia. Why? Because the means of traveling to a magical world is via a common ordinary wardrobe. And how about Alice in Wonderland? Lewis Carroll told his story about a lot of things Alice Liddell already knew, such as chair legs and a deck of cards. So from your desk to your computer or chair, what can you really see when you look closely? Also, go beyond the somewhat common idea of a computer sucking someone into cyberspace. It’s not a bad idea; it’s just been done a lot. Maybe your character is buried by paper. Or they end up in the vacuum cleaner. Attics and cellars can seem very frightening. What about the walls, or the ceiling? And then we get to the outside. So what do we see? Carroll saw hedgehogs, dormice, and rabbits. We can also see plants, of course. Are they large and menacing, or small and fragrant? And what about natural structures or scenery, such as mountains, rivers, lakes, and canyons? Part of The Wizard of Oz takes place in an apple orchard. It’s easy to see how and why L. Frank Baum imagined trees talking and even throwing fruit. How about imagining how a certain structure came to be? We all know (or at least we should) that craters come from falling meteors or even comet strikes. But what if a crater exists because a spaceship landed there? A structure like Stonehenge can also inspire. Get outside and take stock of your surroundings. They may inspire more than you think.